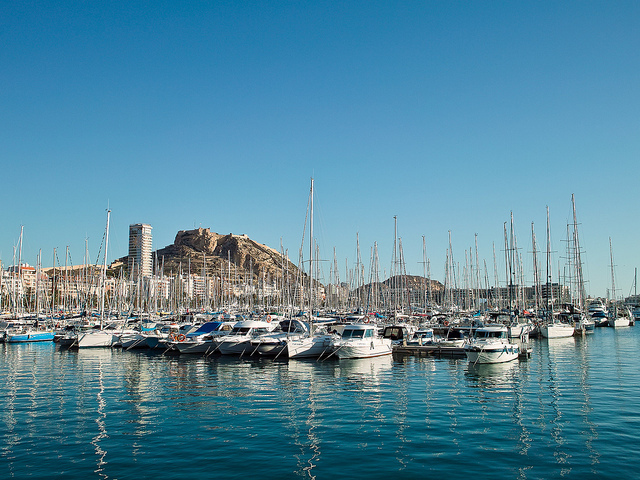 Overlooking Alicante cruise port, stylish marina and city beach is Mount Benacantil, an iconic rock formation which has served a defensive function for the different civilisations which have settled on this coastline over the centuries. The first settlers were Iberian tribes as far back as 5000 BC who were replaced by Phoenicians, Carthaginians and Romans before the city was conquered by the Moors in the 8th century. It was under Moorish rule that a fortification was first built on top of Mount Benacantil to protect the city. As you walk towards the city from the port take a look at the south-western slope of this hill and see if you can spot ‘La Cara del Moro’ – the Moor’s face. 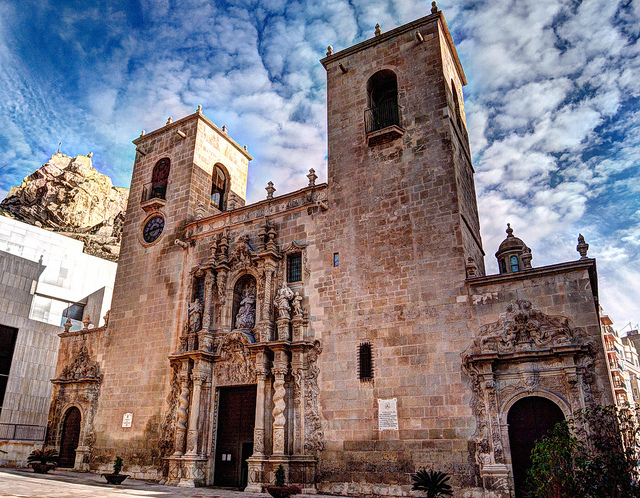 Today the medieval Castle of Santa Barbara sits on top of the hill and is Alicante’s main historic attraction. Below Mount Benacantil is the Port of Alicante which is a very busy maritime destination attracting almost 100,000 cruise ship passengers per year as well as many North African people heading over to Algeria on international ferries. The cruise port lies just west of the marina, very close to the old town, with most cruise ships docking at the outer sea wall along Muelle Levante. From the cruise terminal to the entrance to the port complex is approximately 1.5km. Passengers can either walk this distance or wait a few minutes for the free shuttle bus which drop them off at the port entrance. On Foot: The Port Authority’s shuttle bus will drop passengers off at Plaza Puerta Del Mar next to the port entrance. From here most passengers will be able to walk around the city’s main attractions. Simply turn left (west) to take a stroll along the beautiful esplanade or turn right (east) to go to the beach at Playa del Postiguet. If you’re heading for Santa Barbara Castle it’s best to walk to the elevator opposite the beach which takes you to the top of Mount Benacantil. Hop-on, Hop-off Bus: Alternatively, you can take the tourist bus service from Plaza Puerta Del Mar which offers a ten stop itinerary including the castle. This is a useful service for visitors with limited mobility but isn’t as rewarding as walking around the city as the bus route cannot access much of the old town. There’s a tourist office on Plaza Puerta del Mar where you can pick up city maps, otherwise you can go to the city’s main tourist information office located at Rambla Méndez Núñez, 41. There are some useful apps available for download on the official Alicante tourism website. Castillo de Santa Barbara: Looking down on you over to the north-east as you alight from the shuttle bus in Plaza Puerta del Mar is the 16th century Castle of Santa Barbara. The walk to the top from the northern side is not recommended in the heat of the summer, instead visitors should take the lift which leaves from just opposite El Postiguet beach. The castle stands 166 metres above the city which gives visitors great views over the old town and the Mediterranean. Barrio de Santa Cruz: The walk down from the castle through Parque de La Ereta to Barrio de Santa Cruz (at the top of the old town) is highly recommended provided you can cope with all the steps. This is the oldest part of the city where people still live in colourful houses elaborately decorated with flower pots. There are many nice bars and restaurants tucked away in this friendly neighbourhood where you can sit at an outdoor terrace and enjoy the atmosphere of this charming area. Basilica de Santa Maria: With its Valencian-Gothic façade this is the city’s oldest church which was built between the 14th and 16th centuries on the site where a mosque used to stand. It is located in the delightful Plaza Santa Maria within a short walk of the entrance to the port. 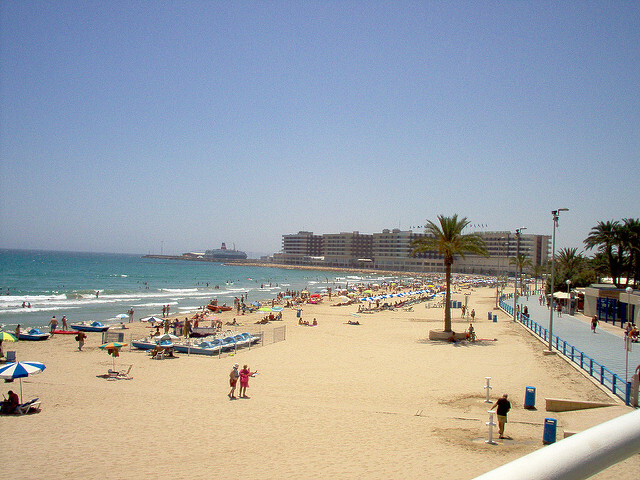 Playa del Postiguet: Just east of the entrance to the port on the other side of the Hotel Meliá Alicante is a popular sandy beach which is packed with local people at weekends. It’s safe to swim here and has been awarded a blue-flag for its cleanliness. Even if you don’t fancy a dip it’s a lovely place to stroll along the palm lined boardwalk at the back of the beach in the shadow of Mount Benacantil. There are plenty café-bars and restaurants overlooking the beach where you can enjoy a pleasant lunch with sea views. 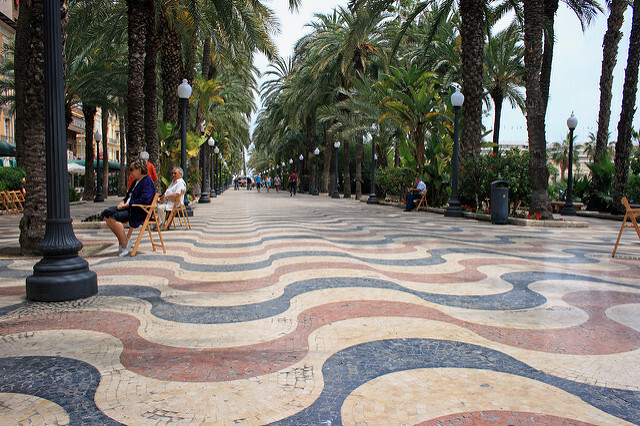 Paseo de la Explananda de España: Heading west from the entrance to the port in the opposite direction of the beach is Alicante’s famous esplanade which has been constructed with millions of colourful bricks in a mosaic pattern. Every evening it seems like the whole of the city is out on this boulevard for their daily ‘paseo’. Being located so close to the port makes it an ideal spot for passengers to take an afternoon stroll in the shade of the palm trees whilst stopping for a drink or an ice cream at one of the many cafés before returning to their ship. Mercado Central (Avenida Alfonso El Sabio 8): Right in front of the Central Market, just north of the old town, is a famous square known as La Plaza de las Flores. It was here in May 1938 that more than 300 civilians died at the hands of Italian bombers during the Spanish Civil War. Relatively little has been written about the atrocities of this deadly bombing campaign compared with what happened at Guernica in the Basque Country yet it was every bit as horrendous an event. Standing on two floors the market remains central to daily life in the city and is a great place to visit as a tourist (unless you’re a vegetarian). Downstairs you’ll find a great selection of stalls selling fresh fish and vegetables then upstairs there are meat stalls selling produce from all over the country as well as some friendly tapas bars where you can have lunch in the company of stallholders and local shoppers. Rambla de Méndez Núñez: For more commercial shopping take a stroll along the La Rambla which is the city’s main arterial road running from the Explananda de España near the port almost to the Central Market. It is also home to many banks, bars and restaurants. Archaeological Museum (MARQ): (Plaza Doctor Gómez Ulla): It’s highly unlikely that you’ll arrive in Alicante on a rainy day, but if you do a visit to the city’s archaeological museum is highly recommended. It houses a number of galleries dedicated to the multiple civilisations who have settled in the region over many centuries and was once awarded the prestigious European Museum of the Year award. Elche: Lying just 30km south-west of Alicante, the city of Elche is notable for having three inclusions on the UNESCO World Heritage List. These are the Palm Grove, the Mystery Play and the School Museum of Pusol. The ‘Palmeral de Elche’ is the main attraction for day visitors along with the 12th century Altamira Castle, the Basilica de Santa María and the charming old town known as El Barrio del Raval. If you can’t book an excursion with your cruise company you can easily take a bus or train from Alicante which both take around 30 minutes each way. Alternatively, you could share a taxi with some fellow passengers from the port entrance. Guadalest: This charming village lies further afield standing some 60km to the north-east, inland from the popular holiday resort of Benidorm. It is best known for its 11th century Moorish castle and is home to a few novel museums such as the Doll’s House Museum, the Salt and Pepper Pots Museum and the Medieval Torture Museum. Unfortunately, its proximity to the holiday resorts of the Costa Blanca and its designation as a ‘Monument of Historical and Artistic Value’ means it is often mobbed with tourists. 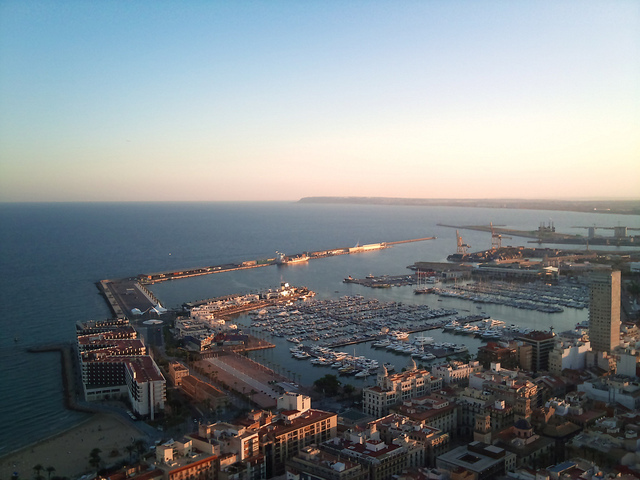 Public transport from Alicante isn’t a possibility considering your limited time in port so taking an official shore excursion is your only option. Isla de Tabarca: You’ll probably have spent enough time at sea by the time you arrive in the Port of Alicante, however, there is an interesting boat trip which deserves a mention. Lying almost 20km to the south, offshore from the resort of Santa Pola, is an interesting island destination which once served as a refuge for Barbary pirates. Today it is a marine reserve which is home to a small fishing fleet. Tourists can visits relics of its colourful past, relax on its glorious beaches and dine in some fine restaurants. Departure times for the one hour journey from Alicante vary throughout the year so you should check timetables on the Cruceros Kontiki Website. Alicante Airport: This busy airport lies approximately 15km south-west of the Port of Alicante. The frequent C-6 bus runs between the arrivals terminal and the city centre. Many taxis and private shuttle services are available. Hotels in Alicante: Check out Booking.com for the best range of hotels offers in Alicante.